At Elite Pork, a large pork farm in Ralson, Iowa, pigs are fed antibiotics for weeks after weaning to ward off possible illness. The questions over antibiotics come at a time when animal confinement methods and other aspects of so-called factory farming are also under attack. Excenel RTU antibiotic at Elite Pork. RALSTON, Iowa — Piglets hop, scurry and squeal their way to the far corner of the pen, eyeing an approaching human. “It shows that they’re healthy animals,” Craig Rowles, the owner of a large pork farm here, said with pride. Mr. Rowles says he keeps his pigs fit by feeding them antibiotics for weeks after weaning, to ward off possible illness in that vulnerable period. And for months after that, he administers an antibiotic that promotes faster growth with less feed. Dispensing antibiotics to healthy animals is routine on the large, concentrated farms that now dominate American agriculture. 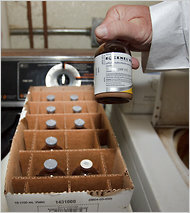 But the practice is increasingly condemned by medical experts who say it contributes to a growing scourge of modern medicine: the emergence of antibiotic-resistant bacteria, including dangerous E. coli strains that account for millions of bladder infections each year, as well as resistant types of salmonella and other microbes. Now, after decades of debate, the Food and Drug Administration appears poised to issue its strongest guidelines on animal antibiotics yet, intended to reduce what it calls a clear risk to human health. They would end farm uses of the drugs simply to promote faster animal growth and call for tighter oversight by veterinarians. The agency’s final version is expected within months, and comes at a time when animal confinement methods, safety monitoring and other aspects of so-called factory farming are also under sharp attack. The federal proposal has struck a nerve among major livestock producers, who argue that a direct link between farms and human illness has not been proved. The producers are vigorously opposing it even as many medical and health experts call it too timid. Scores of scientific groups, including the American Medical Association and the Infectious Diseases Society of America, are calling for even stronger action that would bar most uses of key antibiotics in healthy animals, including use for disease prevention, as with Mr. Rowles’s piglets. Such a bill is gaining traction in Congress. With the backing of some leading veterinary scientists, farmers assert that the risks are remote and are outweighed by improved animal health and lower food costs. 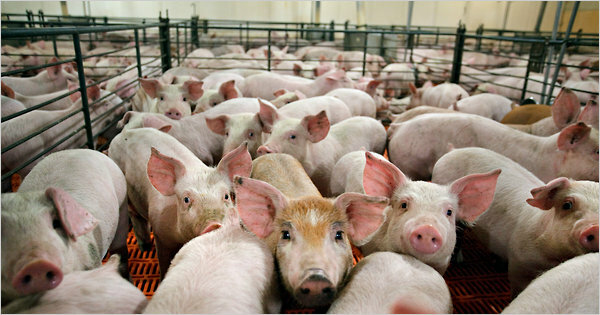 “There is no conclusive scientific evidence that antibiotics used in food animals have a significant impact on the effectiveness of antibiotics in people,” the National Pork Producers Council said. But leading medical experts say the threat is real and growing. Proponents of strong controls note that the European Union barred most nontreatment uses of antibiotics in 2006 and that farmers there have adapted without major costs. Following a similar path in the United States, they argue, would have barely perceptible effects on consumer prices. Resistance can evolve whenever drugs are used against bacteria or other microbes because substrains that are less susceptible to the treatment will survive and multiply. Drug use in humans, including overuse and misapplication, clearly accounts for a large share of the surge in antibiotic resistant infections, a huge problem in hospitals in particular. Yet biologists and infectious disease specialists say there is also enormous circumstantial and genetic evidence that antibiotics in farming are adding to the threat. As drug-resistant strains of microbes evolve on the farms, they are passed along in meat sold in grocery stores. They can infect people as they handle the uncooked product or when eating, if cooking is not thorough. The dangerous strains can also enter the environment via manure or the clothes of farm workers. Genetic studies of drug-resistant E. coli strains found on poultry and beef in grocery stores and strains in sick patients have found them to be virtually identical, and further evidence also indicated that the resistant microbes evolved on farms and were transferred to consumers, said Dr. James R. Johnson, an infectious-disease expert at the University of Minnesota. Hospitals now find that up to 30 percent of urinary infections do not respond to the front-line treatments, ciprofloxacin and the drug known as Bactrim or Septra, and that resistance to key newer antibiotics is also emerging. E. coli is also implicated in serious blood, brain and other infections. The proposed Food and Drug Administration guidelines focus on the use of antibiotics to speed growth. Just how antibiotics have this effect, which has been known for decades, is unclear, but scientists suspect that the drugs improve the absorption of nutrients as they prevent low-grade disease. Mr. Rowles, the proprietor of Elite Pork and a trained veterinarian himself, estimates that by feeding his pigs an antibiotic in their final months he is saving $1 to $3 per animal in feed costs. For the consumer, this is negligible, but from his perspective it looms larger because, he said, in good years his net profit is only $7 to $10 per animal. More contentious is the routine use of antibiotics to prevent disease, as Mr. Rowles and other pork producers do with newly weaned pigs. Dr. James McKean, an extension veterinarian at Iowa State University, said experience in Denmark, Europe’s leading pork producer, showed that ending the practice would result in more illness, suffering and death among pigs, and cause a jump in antibiotic treatments of actual disease. Dr. McKean estimated that a ban on most nontreatment uses of antibiotics would raise the cost of pork by 5 cents a pound. Others counter that farmers in Denmark have learned to hold down illness in young pigs by extending the weaning period, altering feeds and providing more space and veterinary scrutiny of the animals. Some of the drugs used in prevention by farmers like Mr. Rowles would also be permitted under the measure before Congress because they are not used in human medicine. “My only concern is that we make decisions in a scientific fashion, not a political fashion,” he said.